iMessage is important for all the Apple users as it helps to communicate internationally . This free instant messaging service is exclusively designed for iOS users by Apple and allows users to send unlimited texts, images, videos, contacts etc. It uses the WiFi or the data connection to send the messages rather than any SMS plan provided by your network service provider. And it can be used on device running iOS 12/11, iOS 10 and previous iOS versions. But imagine you receive some iMessages from a random stranger and you want to delete them. You do the same but then realize that you have deleted some other important messages instead of the ones you wanted to. Or, you just want to delete some messages to free up the space on your iPhone. However, you find you need them back for certain reason. To make matters worse, you don't have a backup for the messages. You panic, not knowing what to do to recover the iMessages without a backup. Such cases happen to many of us. Do not need to worry anymore. This article is aiming to rescue you out of such cases, even you are using the latest iOS 11/12. Q. Can I Recover Deleted iMessages without Backup? The answer is definately yes. iPhone saves data on a database called SQLite. When you delete iMessages, it just changes from "Allocated" to "Unallocated", but leaves the actual data sitting there. Some day, when you create new data, the space for the "Unallocated" entries will be firstly occupied and overwritten with new information. So please note that if you want to get the deleted iMessages back, you should stop using your device after losing data. Any new data written into your device might overwrite your lost iMessages and make them unrecoverable. Actually, you can lose iMessages that haven't been backed up for many other reasons including accidental deletion, a broken device, a virus attack or even iOS 11/12 upgrade. In this case, you need the assistance of a third-party tool that can help you recover the lost iMessages. One of the most popular and powerful data recovery tool to use in this situation is iMyFone D-Back iPhone data recovery. The following are the features that make it the ideal solution. Recover deleted iMessages without backup. Selectively or fully recover deleted iMessages you need. Recover deleted iMessages without affecting current data. Recover deleted iMessages without losing data. 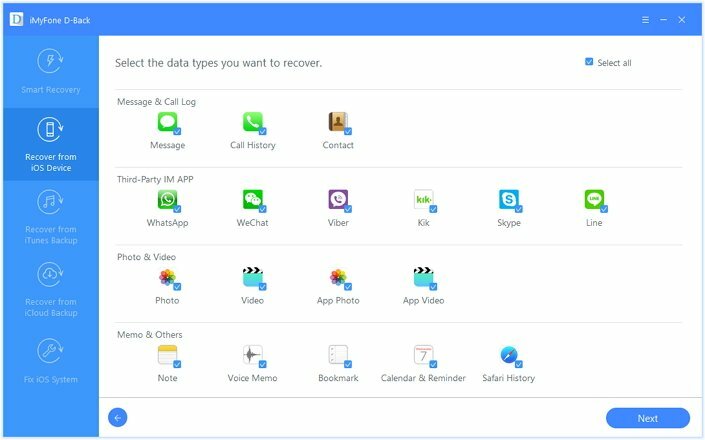 Support to recover 20+ file types, which includes photos, videos, text messages, WhatsApp messages and more. 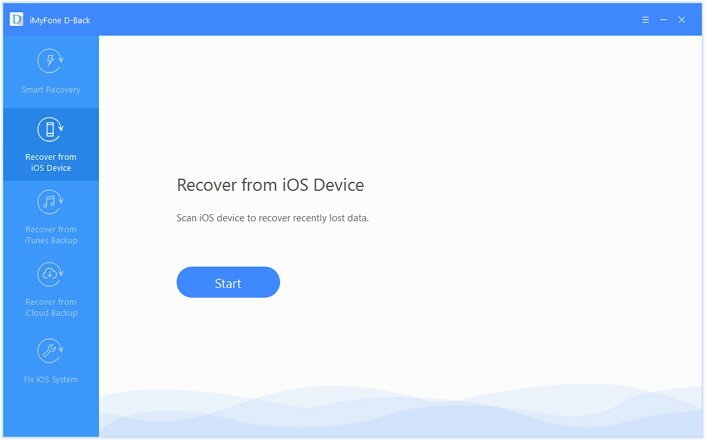 Being recommended by Makeuseof.com and Cultofmac.com, iMyFone is a reliable and efficient tool that helps thousands of people get back their lost data. Preview every single imessages before you recover them. Supports iPhone 7 (Plus)/8/X/XS/XS Max/XR and compatible with the latest iOS 11/12 system . Step 1.Choose "Recover from iOS Device"
Launch iMyFone D-Back on your computer and click on the option "Recover from iOS Device", which is the second option from top, present on the left side of the iMyFone D-Back screen. Now, click on option "Start" that appears on the screen. 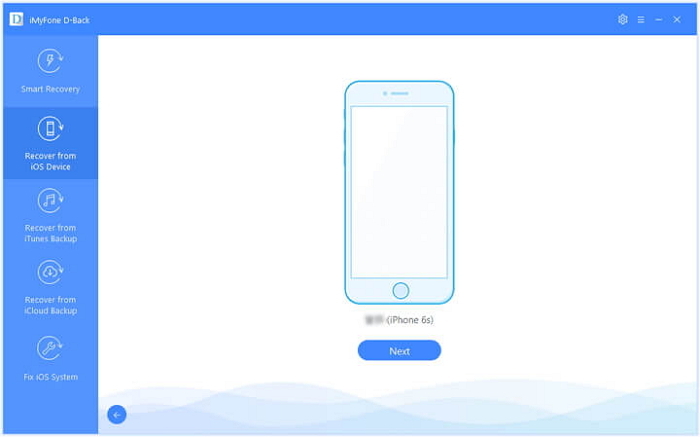 A new screen appears asking you to connect the iOS device to the computer. Connect your iOS device to the computer using the usb cable. Click on the option 'Next'. A new screen appears that asks you for the type of files you want to recover. Select the option 'Message' by clicking on the checkbox adjacent to it. A blue check ensures that option has been selected. 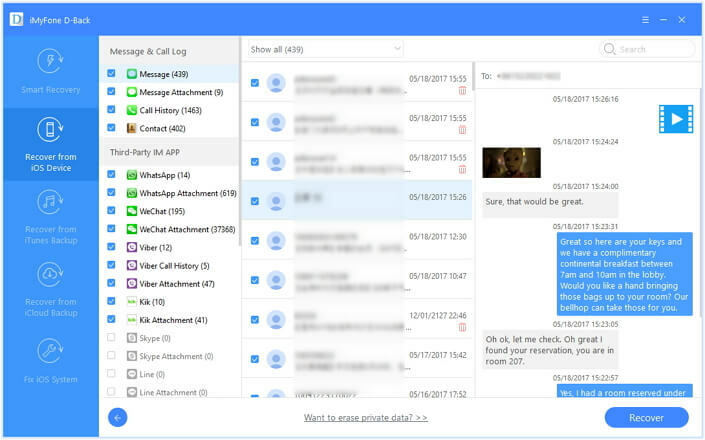 After the scanning has been completed, a new window appears that shows the preview of all the deleted messages. Select the messages you want to recover by clicking on the checkbox next to it and then click on the option 'Recover' that is present at the right bottom corner of the window. A new pop-up window will appear that asks you for the location where you want to save the recovered messages. Select the desired destination to initiate the recovery process. It usually takes a few minutes for the recovery process to complete. The time taken for the recovery process to complete depends on the size of the files to be recovered. Please stop using your iPhone once you have deleted iMessages by mistake, otherwise the data will be overwritten and permanently deleted. You can also use iMyFone D-Back to recover photos from iPhone without backup and more file types, such as contacts,WhatsApp messages. iMyFone D-Back is a powerful recovery tool that helps to recover the deleted iMessages even without a backup very easily just by following the simple steps talked above. You do not need any technical background for using this software. The ability to recover files under various scenarios, easy and simple interface is the major key to success for the product making it one of the favorite products among the users. And don't forget that, even if you use the latest iOS 11/12 on your device, the program can recover your iMessages from it!